News for the Los Angeles Chargers went from bad to worse. 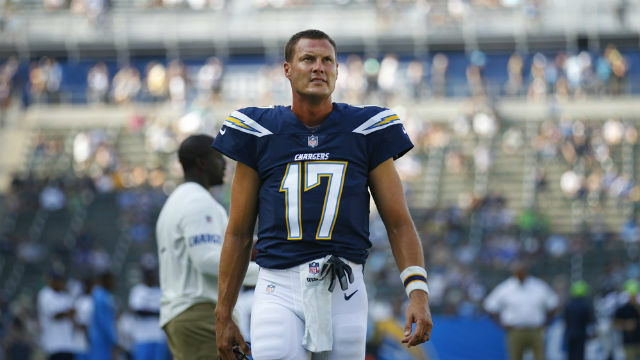 After they lost to the Jacksonville Jaguars on Sunday, quarterback Philip Rivers “self- reported concussion symptoms” Monday, coach Anthony Lynn said. “He’s seen our doctors, he’s been evaluated, he’s now in the concussion protocol and we’ll evaluate him for the rest of the week,” Lynn said at his regularly scheduled Monday meeting with reporters. Lynn said he did not know what play Rivers was injured on. “It was news to me this morning,” said Lynn, who later said he was surprised to learn Rivers had concussion symptoms and did not notice anything wrong with him after Sunday’s game. Rivers played all 69 offensive plays in the Chargers 20-17 overtime loss to the Jaguars on Sunday. He was not sacked but was hit five times. Rivers tackled Jaguars cornerback A.J. Bouye at the Chargers 2-yard line at the end of a 51-yard interception return on what turned out to be the Chargers final offensive play. If Rivers is unable to play in Sunday’s game against the Buffalo Bills at StubHub Center, Kellen Clemens would start in his place, Lynn said. Rivers has started every Chargers regular-season game since the start of the 2006 season, 185 consecutive games. Clemens has been Rivers’ backup since 2014, throwing 10 passes. His regular-season action in 2017 has been limited to three plays as a holder Sunday. The 34-year-old Clemens played in the Chargers’ first two preseason games. He had two passes intercepted and botched a handoff in a 48-17 loss to the Seattle Seahawks Aug. 13. The Chargers were scoreless in their seven first-half possessions with Clemens as quarterback in a 13-7 loss to the New Orleans Saints Aug. 20.